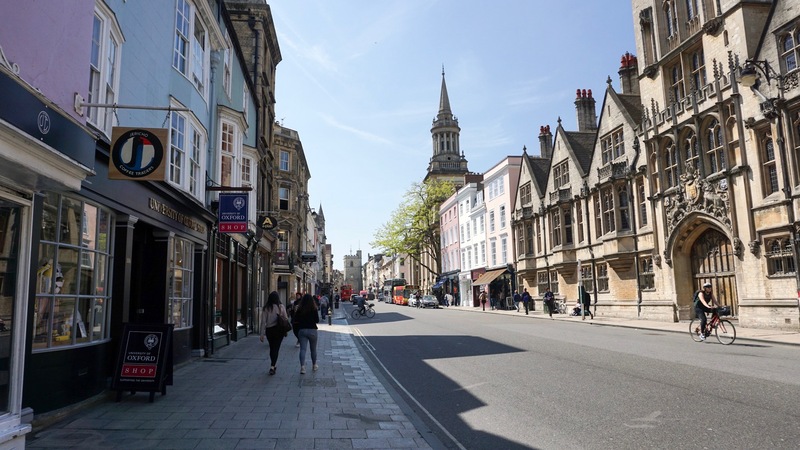 I mostly wanted to visit Oxford for the history. 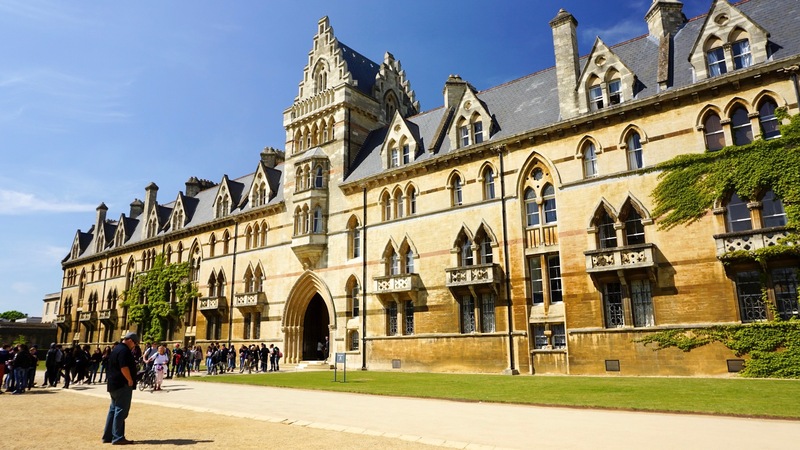 According to the university website, Oxford is the oldest university in the English-speaking world. 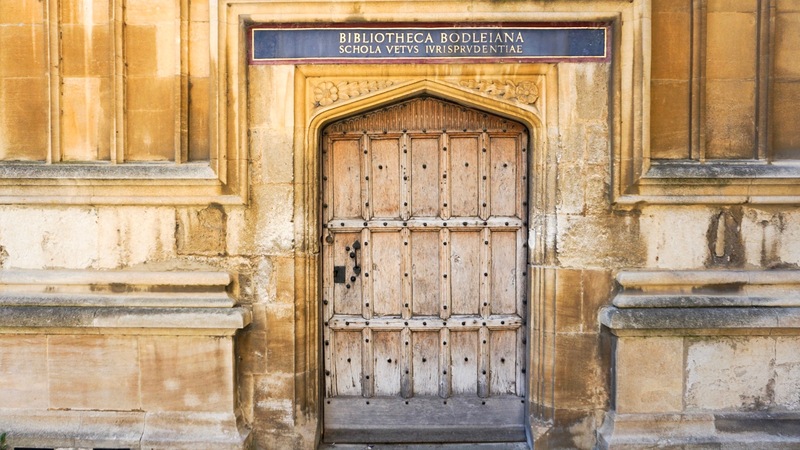 “There is no clear date of foundation, but teaching existed at Oxford in some form in 1096 and developed rapidly from 1167, when Henry II banned English students from attending the University of Paris.” It’s hard to even fathom the impact this one university has had on the intellectual development of the world. 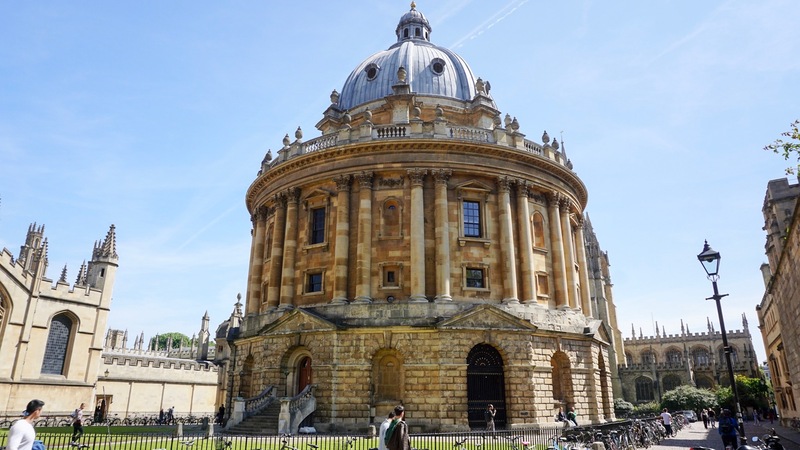 So many brilliant minds have studied here, including one of my favorite authors, J.R.R. Tolkien. However, I must admit that my visit was also somewhat Harry Potter related (are you even surprised?). 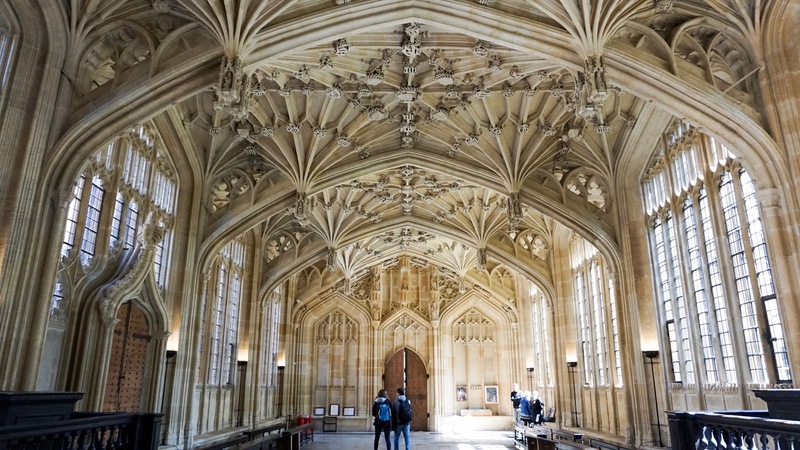 Many buildings in the University served as either inspiration for parts of Hogwarts or as actual filming locations. 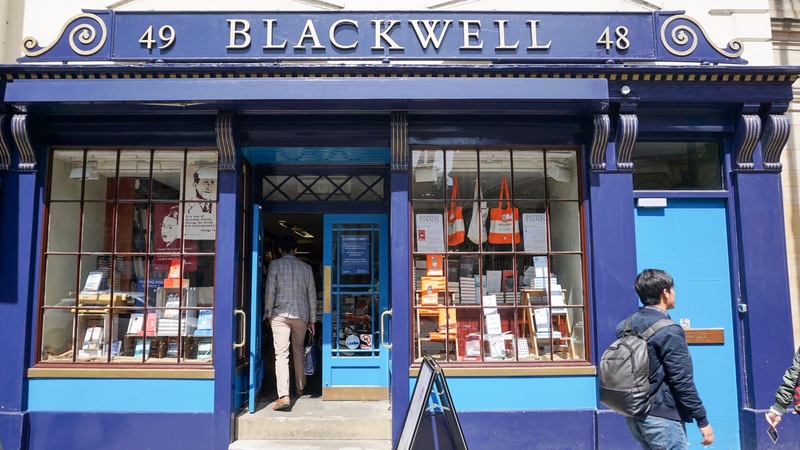 Our first stop was the famous Blackwell’s Bookstore, initially just to make change for the meter, but I was quickly lost amongst the stacks. 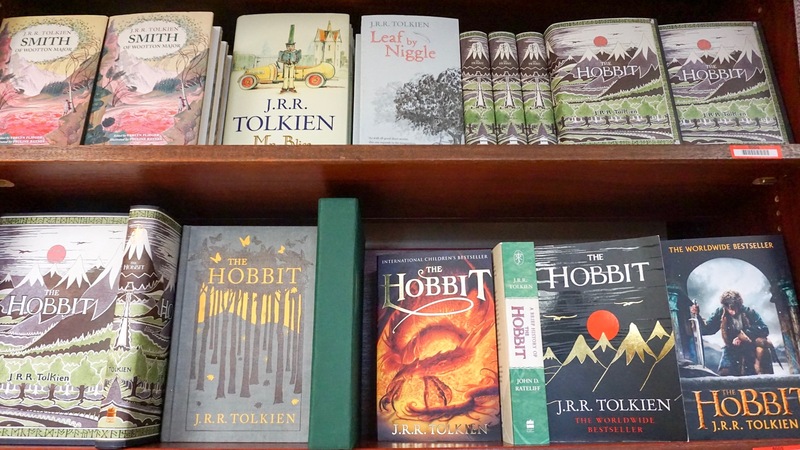 I wanted to buy all of the Tolkien books, but managed to resist. Books would have undoubtably put my luggage over the weight limit and they are probably all available on Amazon anyway. The courtyard entrance from The Broad is just stunning. 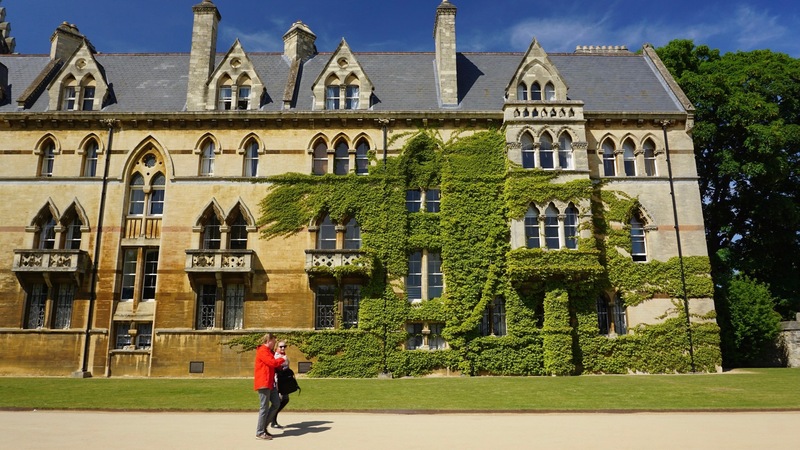 I may never get to study at Oxford but from now on I’m telling people, “I went to Oxford.” Wink, wink. 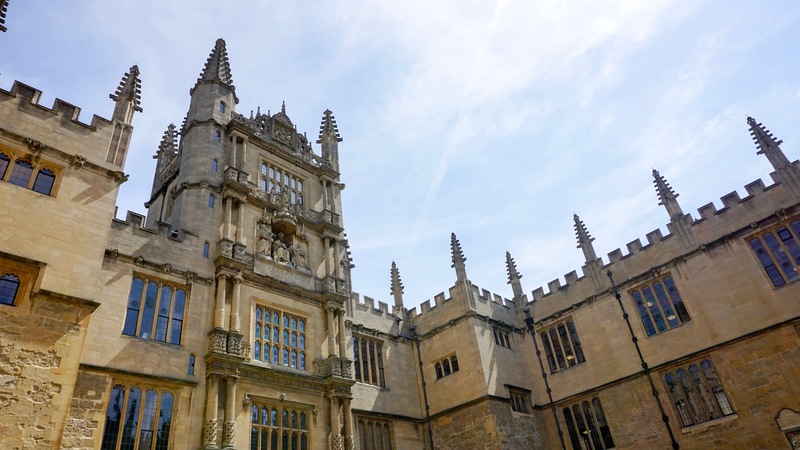 This is the oldest part of the University, home to the ancient Bodleian Library and the original Divinity School. 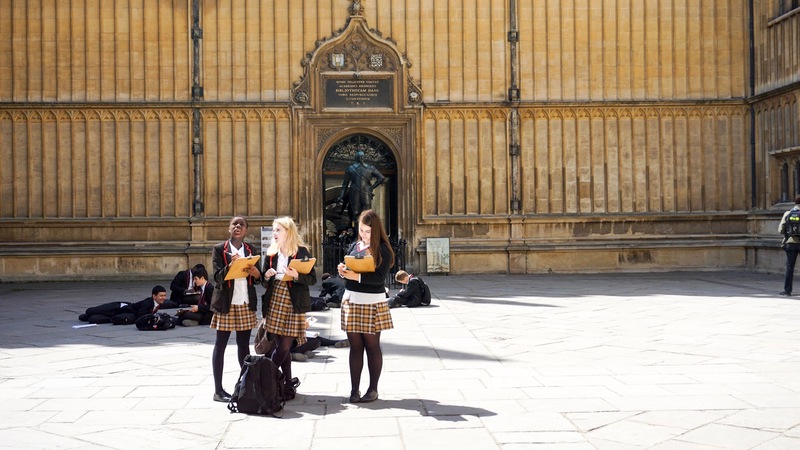 For anyone that is curious, the girls below are not students in Oxford uniforms. This was a group of school girls on a class trip. 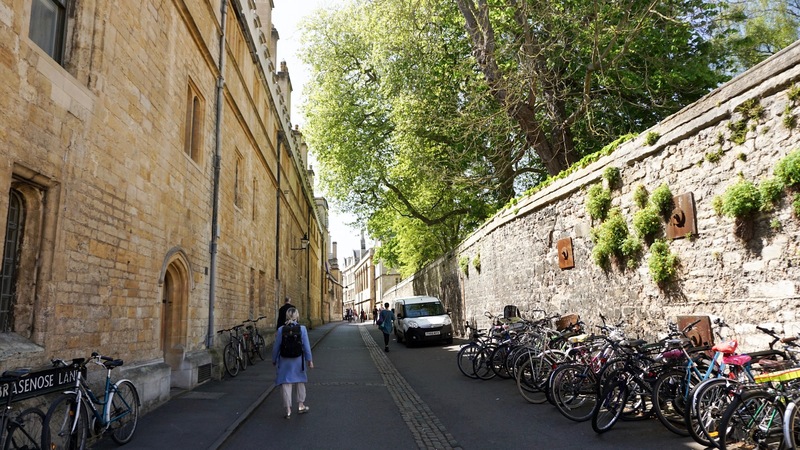 But I love the juxtaposition of the traditional uniforms and the old stone walls of the university. 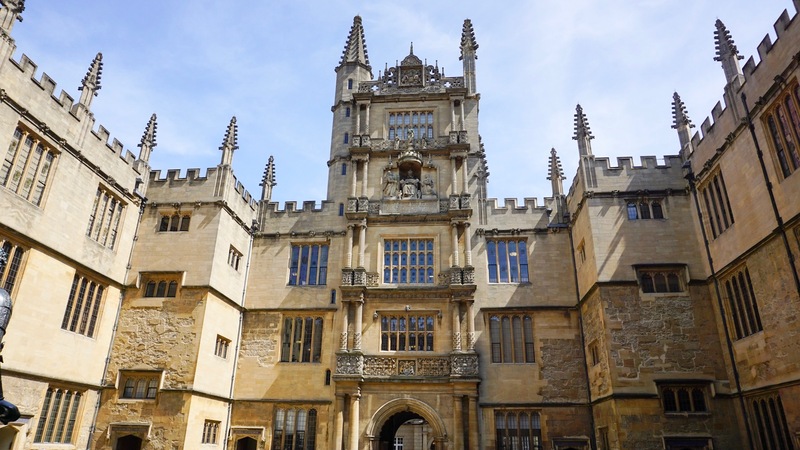 Next stop was a tour of the Bodleian Library. I’m a bit of a dork when it comes to libraries and old books and this is pretty much as good as it gets. 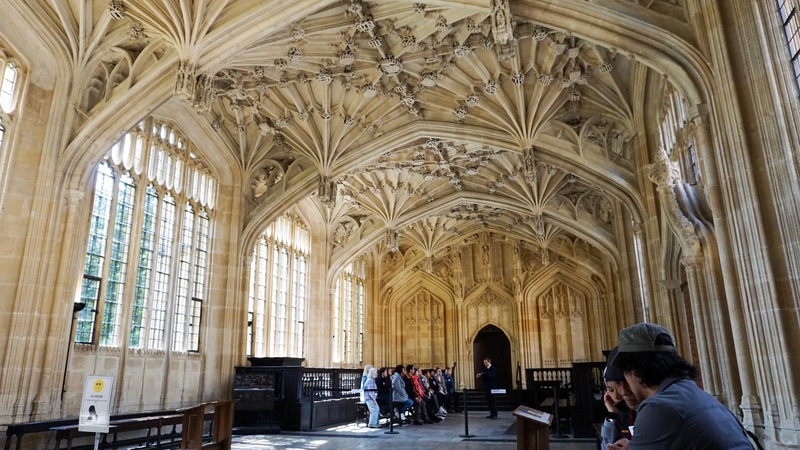 The tour begins in the Divinity School, which was used as the Hospital Wing in the Harry Potter films. 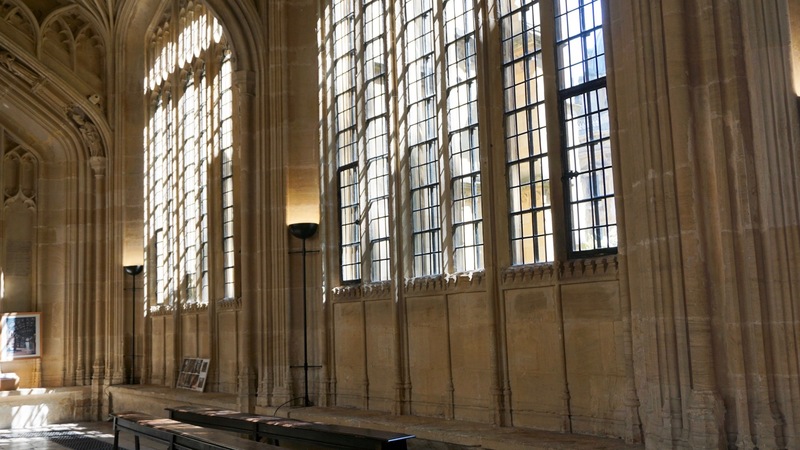 It is a gorgeous hall, full of windows and light and with hundreds of years of history carved into the intricate ceiling trusses. 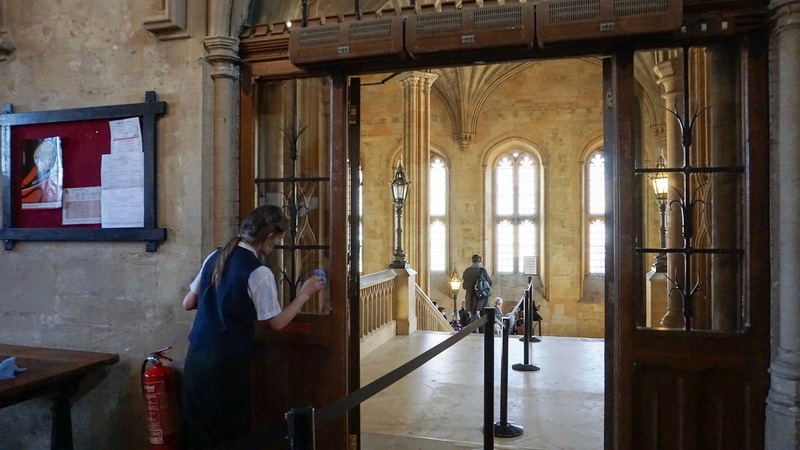 This view is probably familiar to fans of the Harry Potter Films. 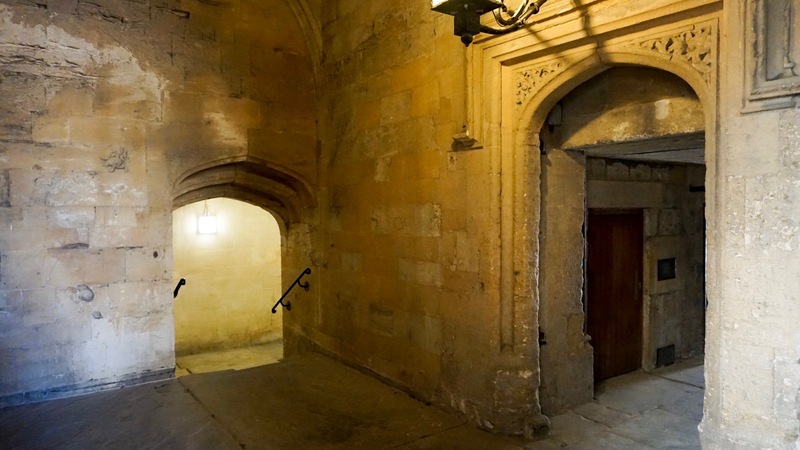 You can probably imagine Madam Pomfrey hustling through with a bottle of Skele- gro potion! The ceiling is a work of art. Each of the trusses is carved with stone commemorations to the various families that donated to the construction of the building. These days a donation to a university might get you a brick with your name on it, or maybe a bench if you were particularly generous. 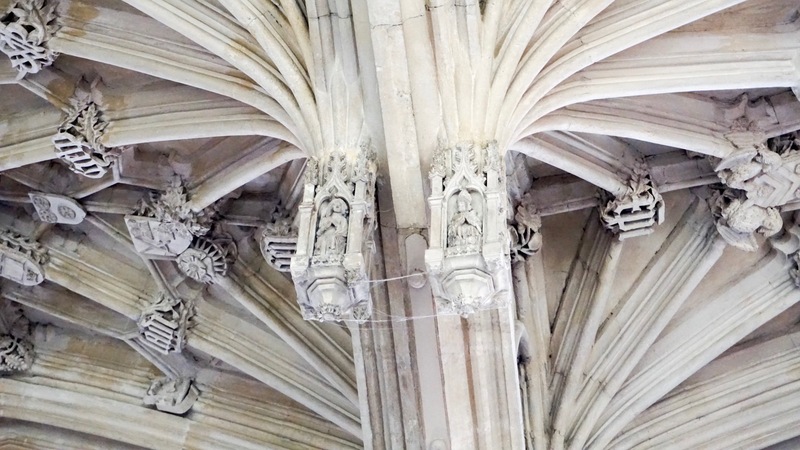 In the 1400s you got a decorative ceiling truss with your family crest on it. 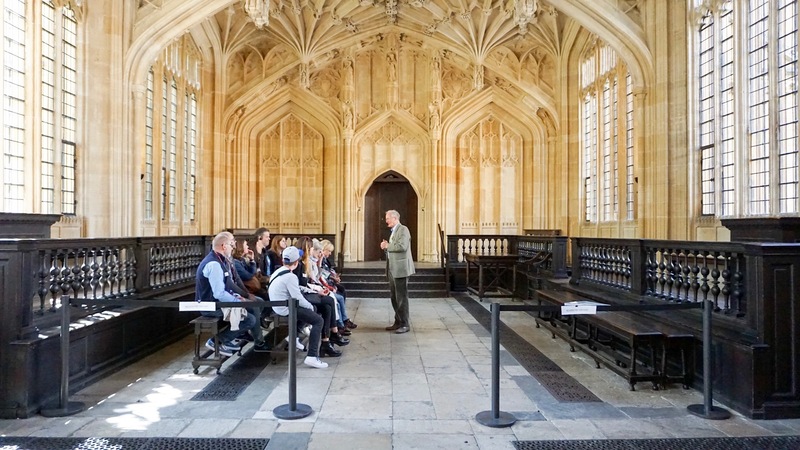 The tour of the library is led by a group of very knowledgable guides. Everyone wears a headset so that you can hear the whispers of the guide as they talk in a low library whisper during the tour. 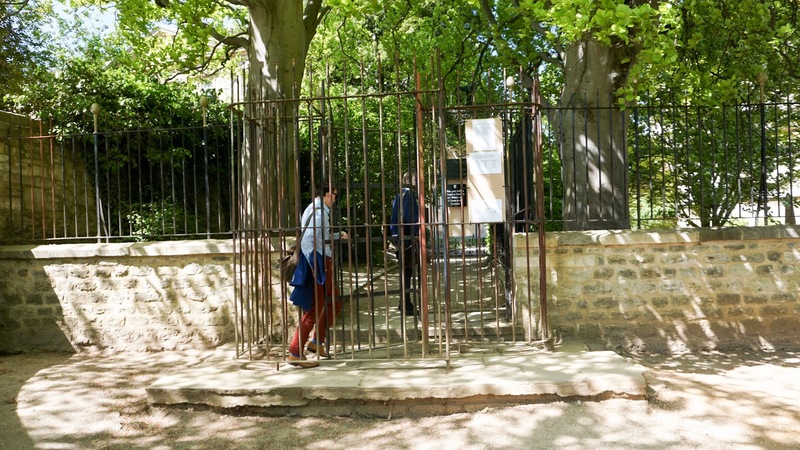 This door is not original to the building and its installation caused a huge controversy within the university. 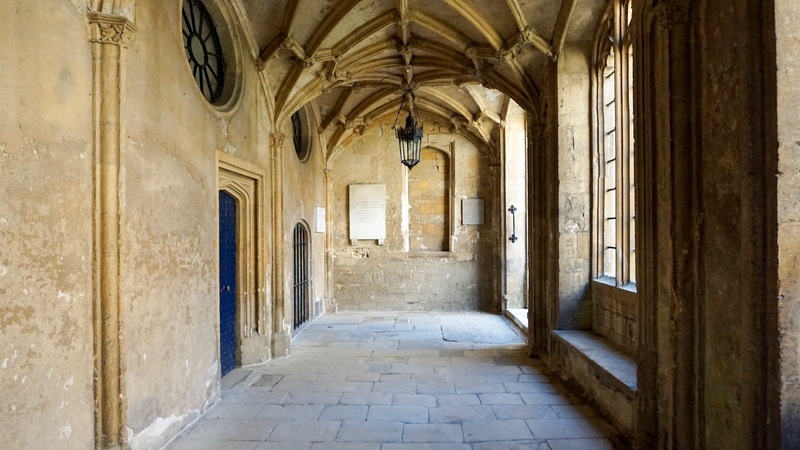 It was added for convenience because this space is used as a gathering place for people during university ceremonies. 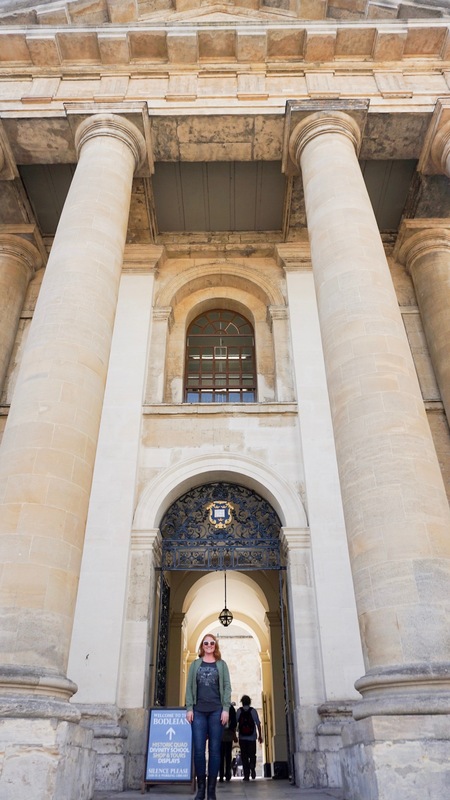 Those being honored would gather here before walking as a group to the nearby Sheldonian Theatre. Before this door was added they had to walk though the courtyard and onto The Broad. 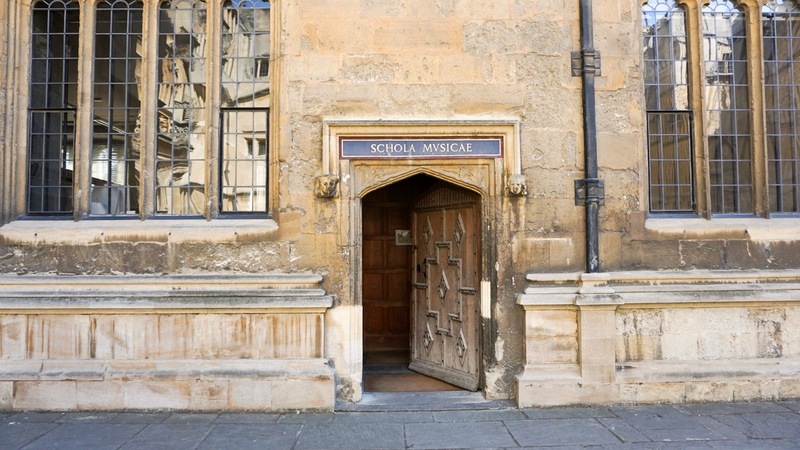 This door essentially provided a backstage entrance for the ceremonies. The controversy involved the symmetry of the building. Before the door it was perfectly symmetrical architecturally. After the door, it was not. This upset a lot of people. I can see their point but I must say that they did a wonderful job of making the door match the rest of the space. Plus, they used a door actually sourced from the time period of the original construction. I would have never known had our tour guide not told us. 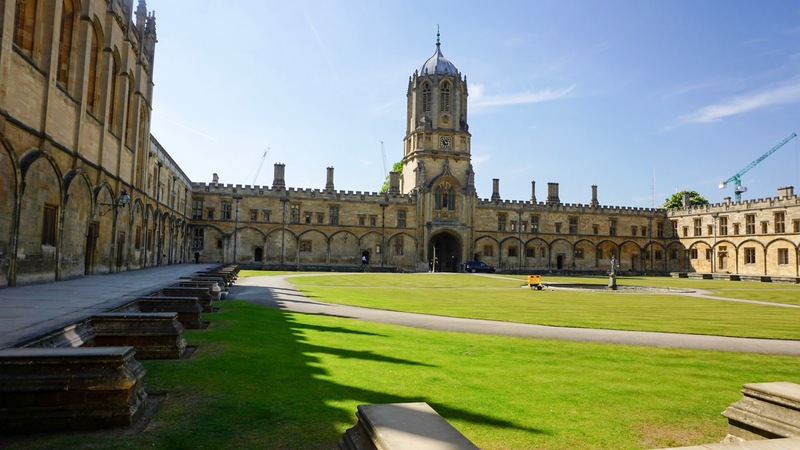 Also, this whole controversy took place in the 17th century and the remodel was done by renowned English architect Christopher Wren. One of the original symmetrical doors. We weren’t allowed to take photos in the library itself or touch any of the books, but it was still spellbinding. 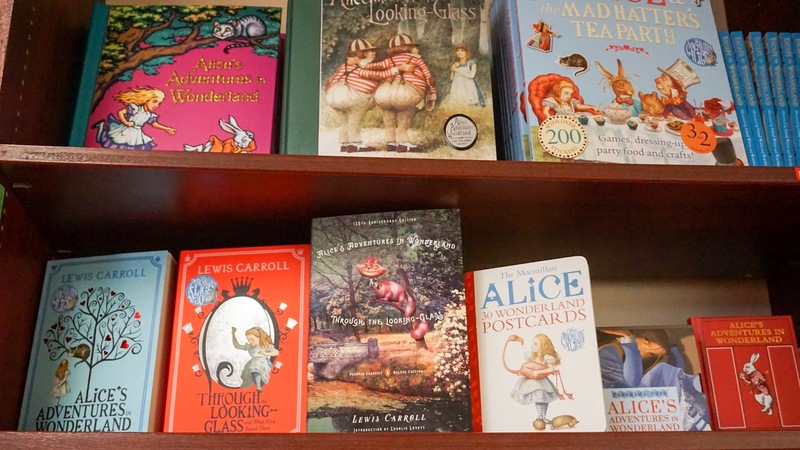 Some of the books were actually still chained to the shelves and, to this day, books are not allowed to be checked-out of the library. 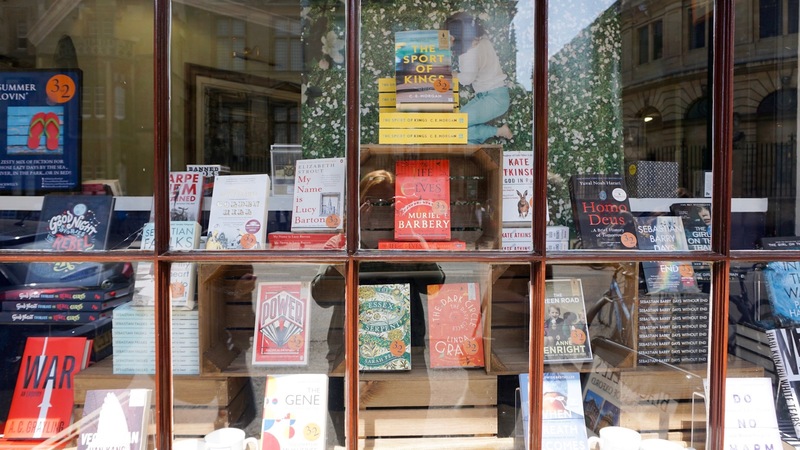 Not even the King or Queen of England is allowed to check-out a book. Various kings and queens have tried over the years and they get the same answer as everyone else — ummm, no, but God Save the Queen. 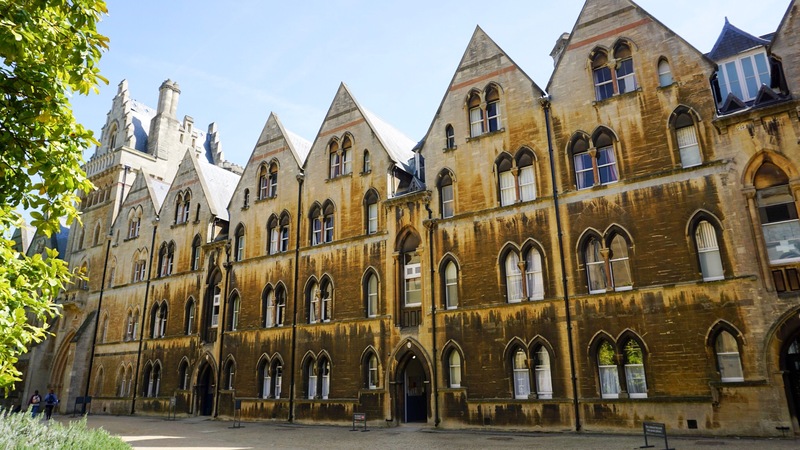 The tour also led us through the Convocation House, the old meeting hall for the school governors which also served as the House of Parliament during times of war. 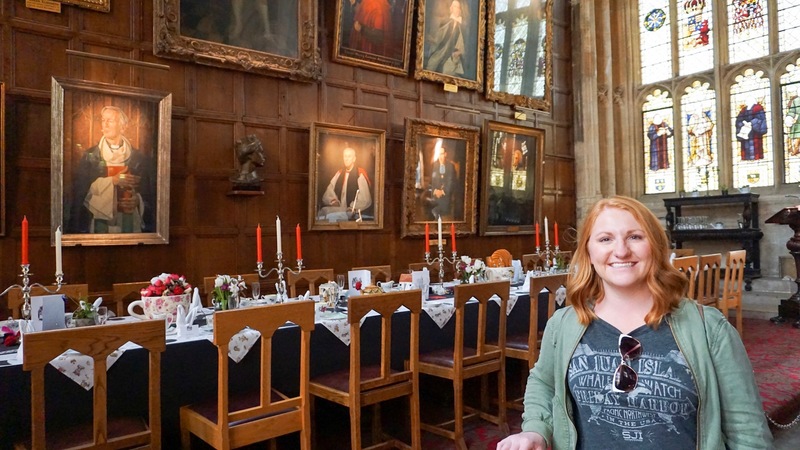 My fellow Potter fans should know that this room also served as a Harry Potter filming location. 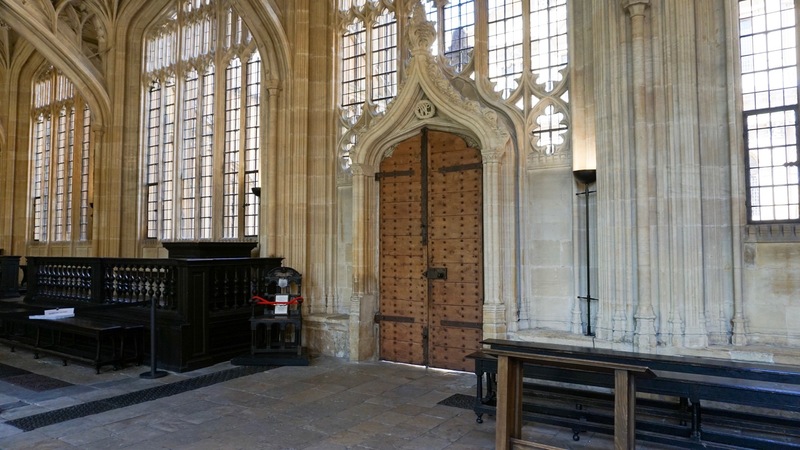 The Convocation House was used as the Ministry of Magic courtroom. Through the magic of film they made it look much larger and rounder than it actually is. 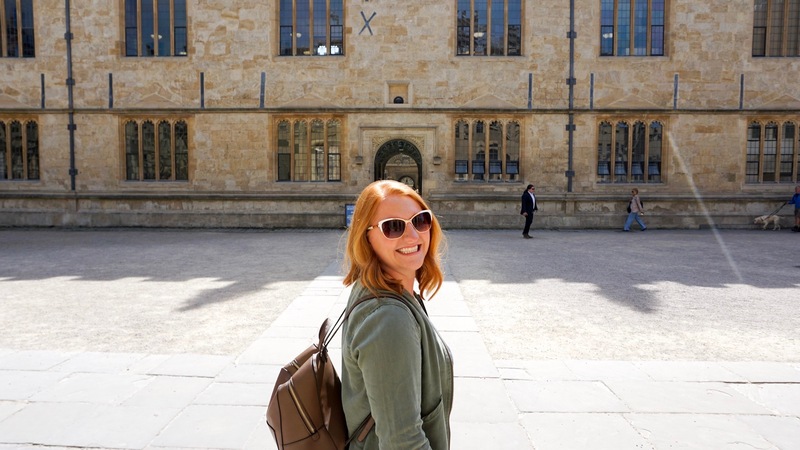 Just thinking of all the great minds that had sat on the same bench I was sitting on was incredible — and of course Dumbledore sat there as well. Just walking though the university campus was an incredible feeling (although I also got the feeling that everyone around me was probably smarter than I am). This place is everything at once — gorgeous, historical, and still completely functional. There were students wandering around with their books, coffee in hand, as they rushed to their classes and exams. Looking back, I wish I would have stopped to talk with some of them. I wonder if they realize how incredible an experience it is to actually go to school here or does it just feel normal to them? We saw bicycles parked en-mass all over the city. This seems to be the main form of transportation here. Which makes perfect sense. 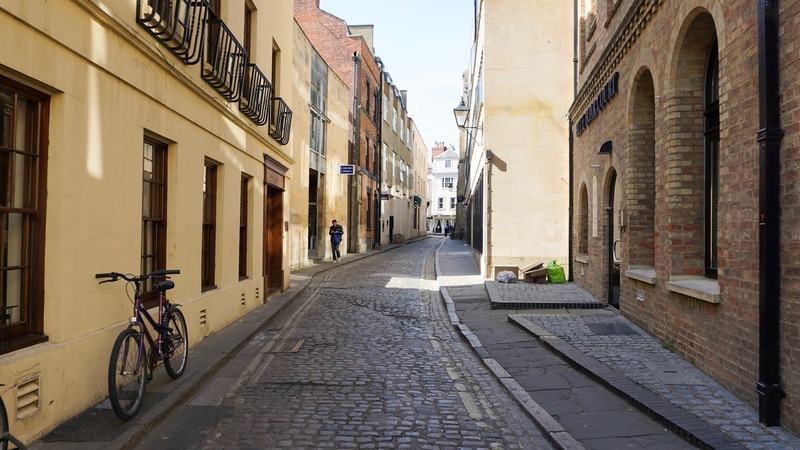 Oxford was not built with cars in mind. After all, it is nearly 1,000 years old. 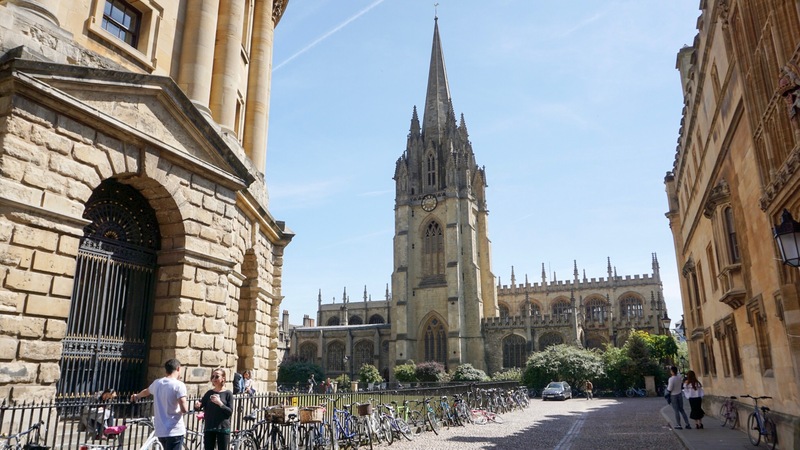 Next we wandered through the center of campus to Christ Church, the oldest of the colleges. 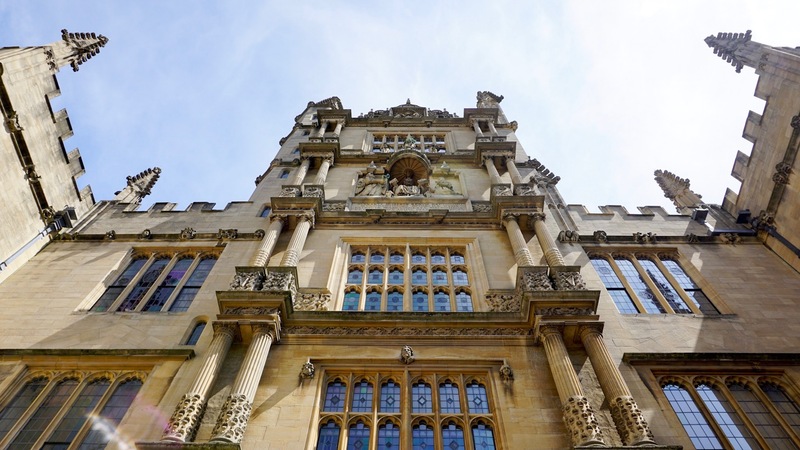 Although Oxford is technically one university, it comprises a number of “colleges” that all function somewhat autonomously — selecting their own students, setting their own curriculum, etc. 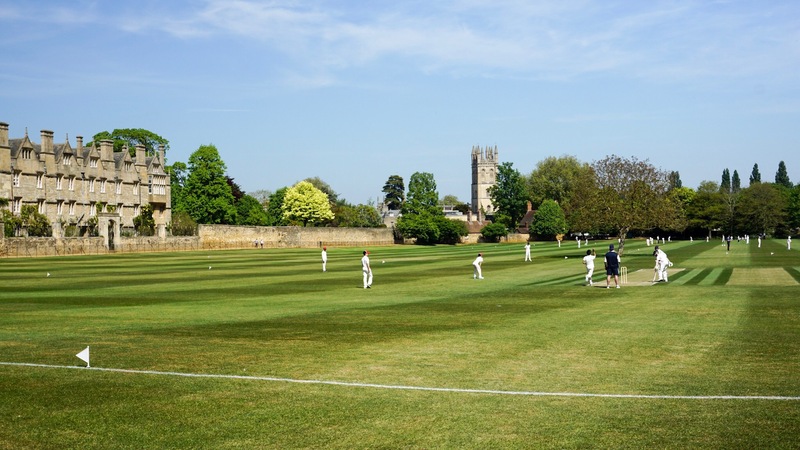 On the way we saw what I believe was little league cricket practice. We stopped to watch for a while even though we had no idea what the rules were. To us it looked most similar to baseball. 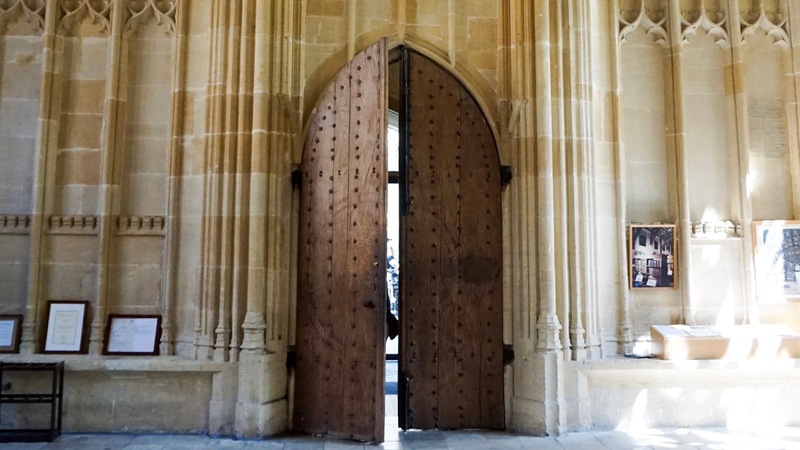 The entrance to Christ Church. 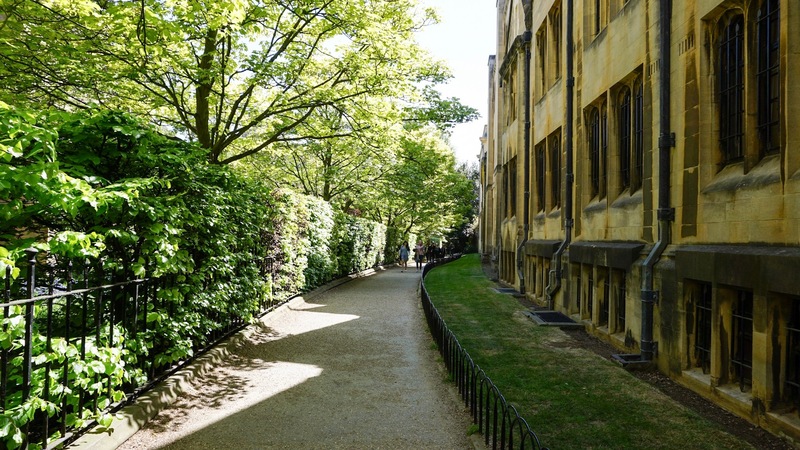 Being the oldest of the colleges, it is also a favorite for visitors, hence the line at the entrance. 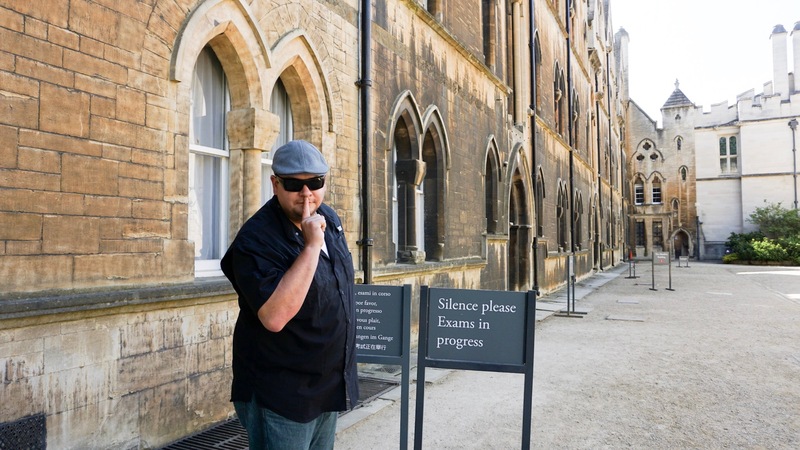 We didn’t see many students wandering about during our visit — Silence please, exams in progress! 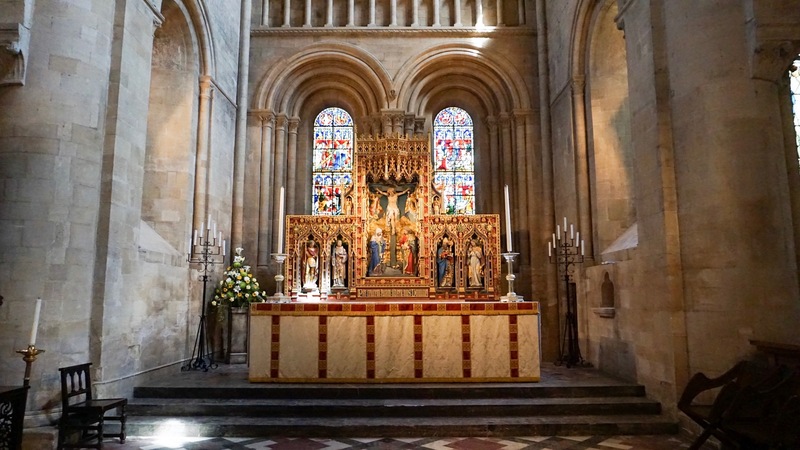 Christ Church was on my list of places to visit mostly because I wanted to see the Great Hall. 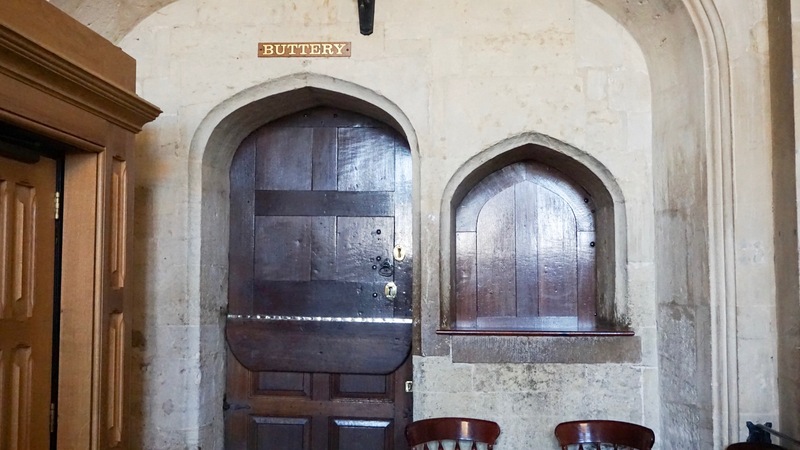 This is where the students eat all of their meals, just as they have for hundreds of years. In fact, they were prepping for dinner while we were there. 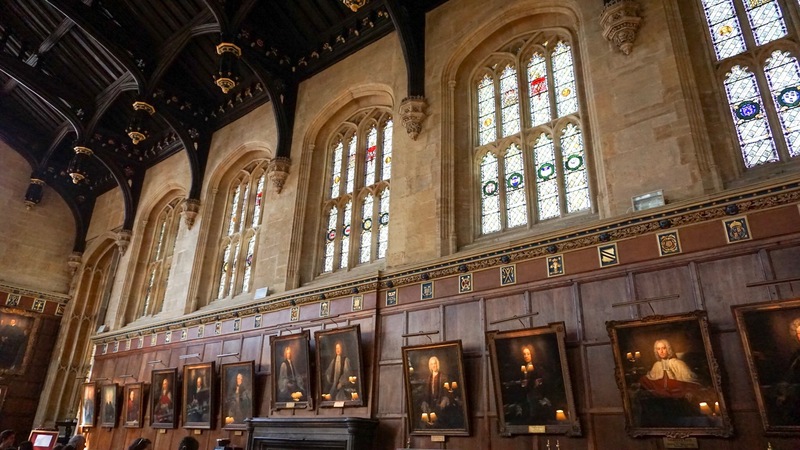 This hall was also J.K. Rowlings inspiration for the Great Hall in Harry Potter, although it was never used for filming. 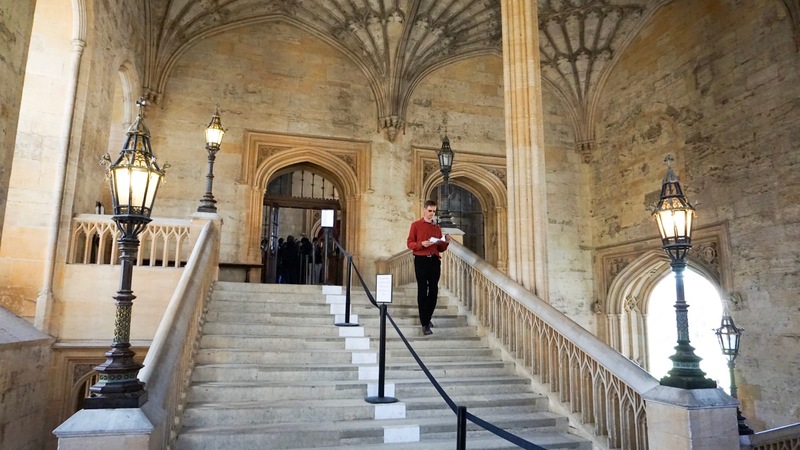 The real life Great Hall fulfilled every expectation I had. I half expected the portraits to start moving. 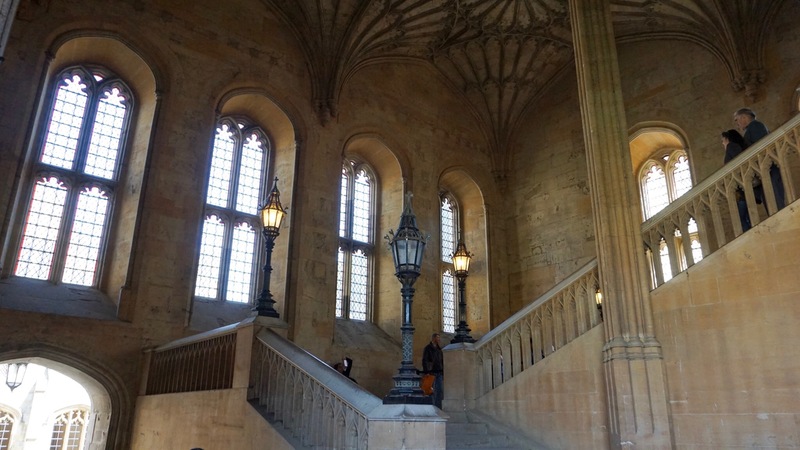 Harry Potter fans might recognize this staircase from the films. And maybe this one as well. 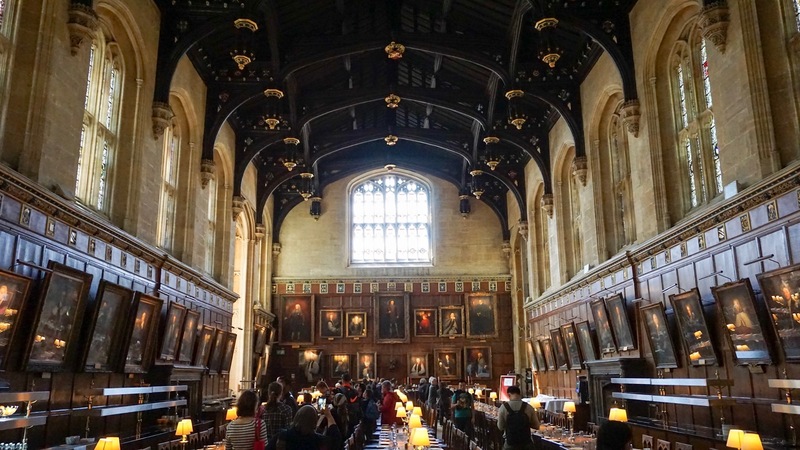 It was impractical to use the Great Hall as a filming location for Harry Potter, after all, the actual university students still need to eat, but you can clearly see the resemblance. I never learned what was contained within the “Buttery” but as a southern girl, I can tell you that I was intrigued. I feel a bit bad for making fun of this woman, but I can’t resist — Christ Church has its own Ms. Filch. Seriously, her in-person resemblance to the Hogwarts caretaker from the films is uncanny. The fact that she was meticulously cleaning an already clean window didn’t help either. 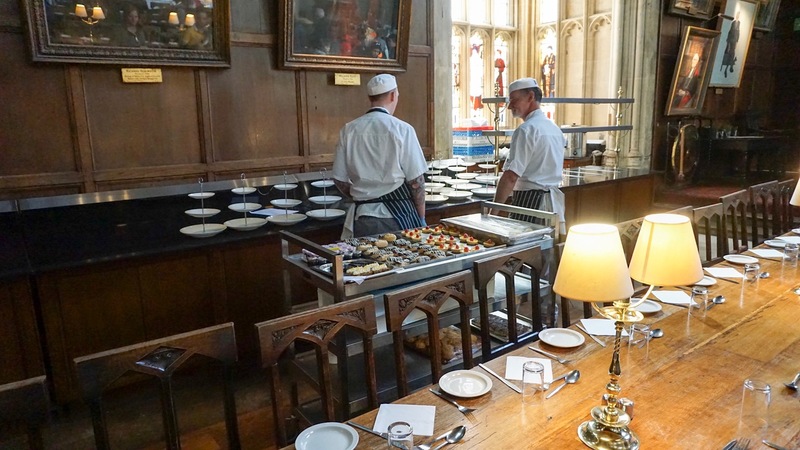 It was unclear whether they were preparing for a special event or just a regular dinner for the students of Christ Church. Obviously fancier than the faire at your typical college dining hall. 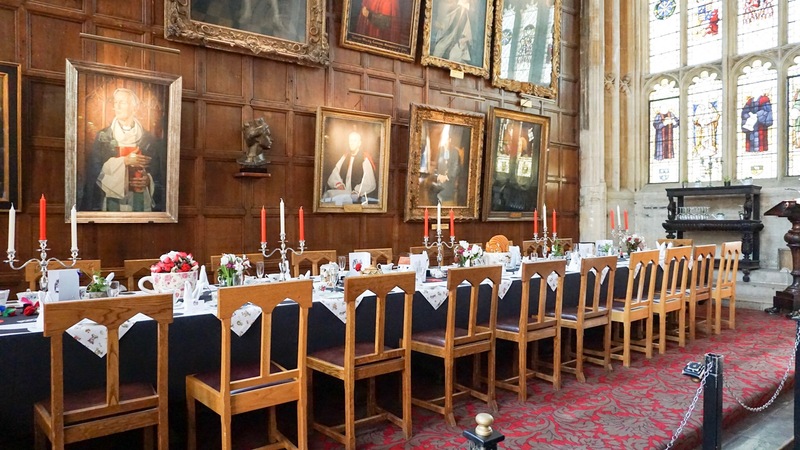 The headmaster’s table has more seats than the one at Hogwarts, but I presume Christ Church has far more professors. I always found the small number of teachers at Hogwarts to be a bit unrealistic. I mean, honestly, with such a high student teacher ratio, they shouldn’t be surprised that complete chaos ensues year after year. It was actually really difficult to get decent photos in the Great Hall. It’s one of the most toured locations on campus so they basically just funnel everyone through in one big line. People stopping to take photos causes a bit of a traffic jam as everyone behind you tries to keep moving. If it weren’t for the cranes in the background and the random yellow construction equipment, you could just maybe imagine you were in medieval England. 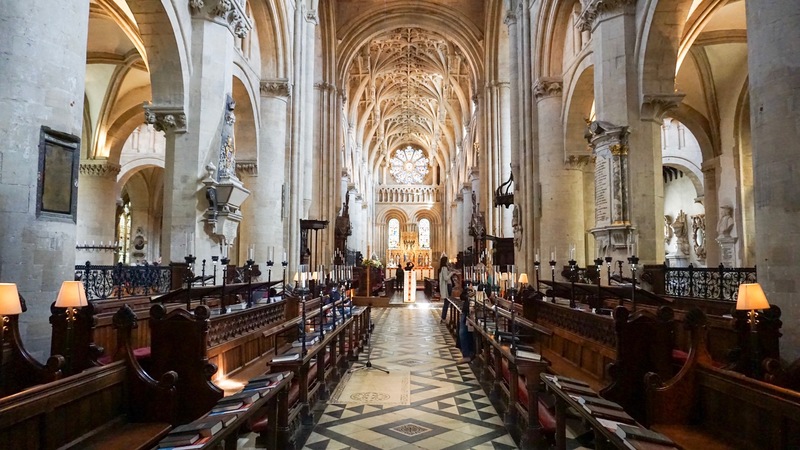 It should be no surprise that the church at Christ Church would be stunning. Those tiled floors in line with the carvings within the archway — so satisfyingly symmetrical. 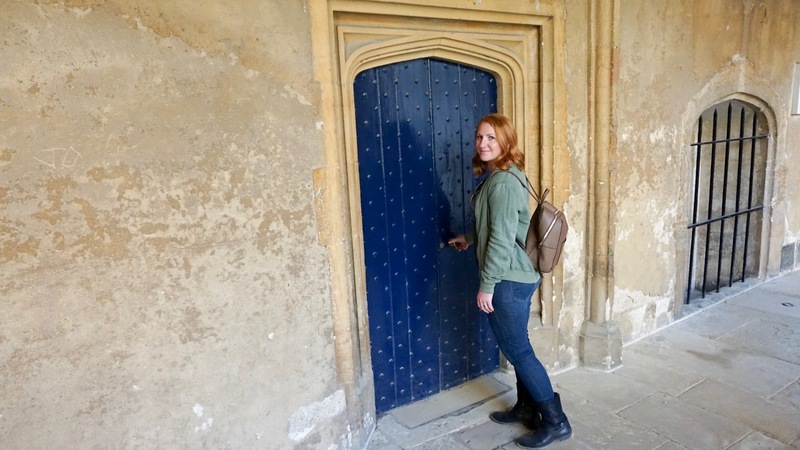 Part of the fun of exploring very old places like Oxford is finding all of the strange nooks and crannies, like this funky corridor to nowhere with the curious blue door. Also note the bricked in window. I suppose this what 1000 years of remodeling leads too. 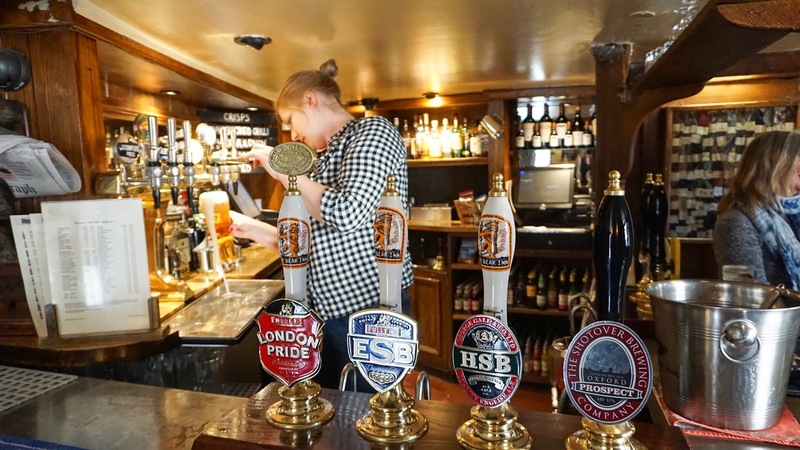 After touring Christ Church we began a short two bar pub crawl tour of Oxford, beginning with the smallest pub and ending with the oldest. 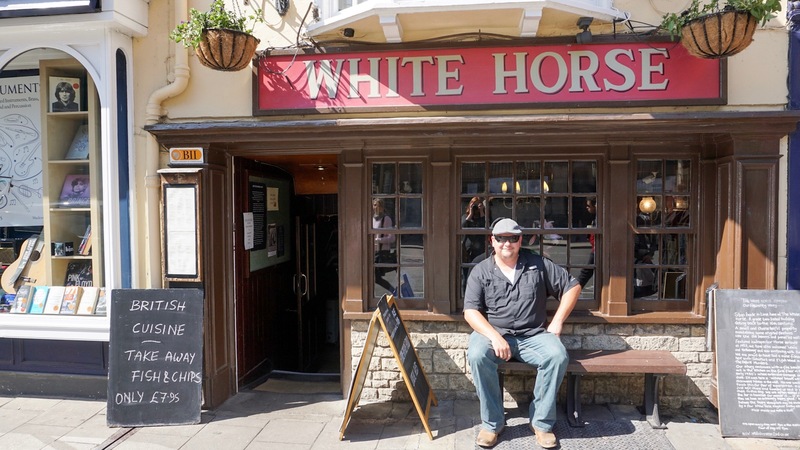 We started at the White Horse, supposedly the smallest pub in Oxford. Plus, it was across the street from our car and we had to, yet again, pump the meter with change. They had surprisingly cheap, delicious, and diverse (for England) lunch options. Brandon had the chicken schnitzel and I had the greek spinach pie. 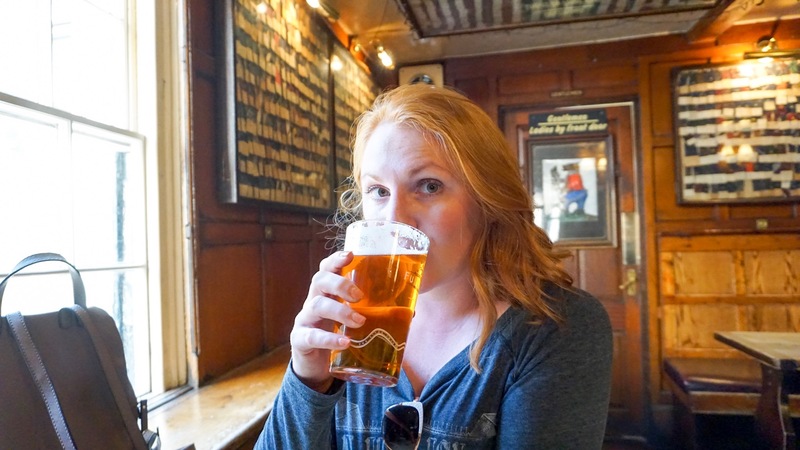 We’ve noticed that most British pubs serve the same dozen options and that’s about it. They’re good options (meat pie, fish and chips, burgers, etc.) but they don’t have a lot of variety. So the diversity of pub cuisine was very much welcome. 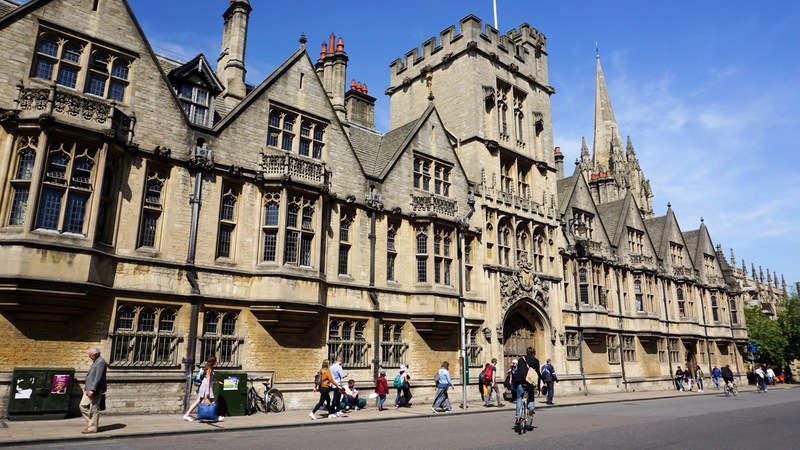 Oxford University has a very diverse and international student body, which probably helps the local resturants to expand thier horizons beyond meat pies with root vegetables and gravy. The White Horse wasn’t as small as I was expecting, little yes, but I’ve probably sat in tinier bars in Portland, Oregon. But with good cheap food and beer right across the street from the library, I can see why this is a student favorite. 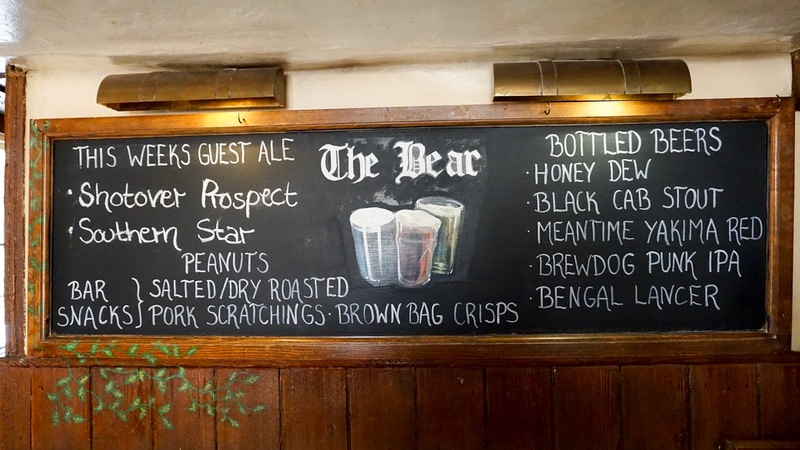 After again pumping the meter, we made our way to The Bear, supposedly the oldest pub in Oxford. 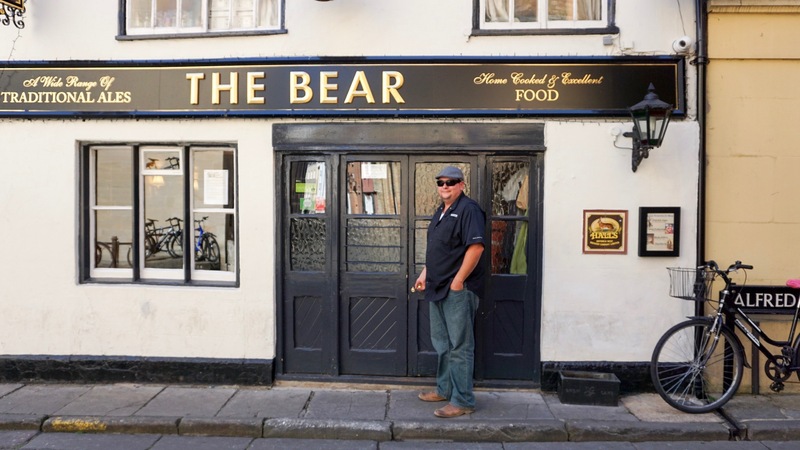 The Bear was original a boarding house, pub, and horse stable for visitors to Oxford. It took up the majority of the block. However, a fire many many years ago torched most of the buildings, only leaving a portion of the horse stables that is now used as the pub. 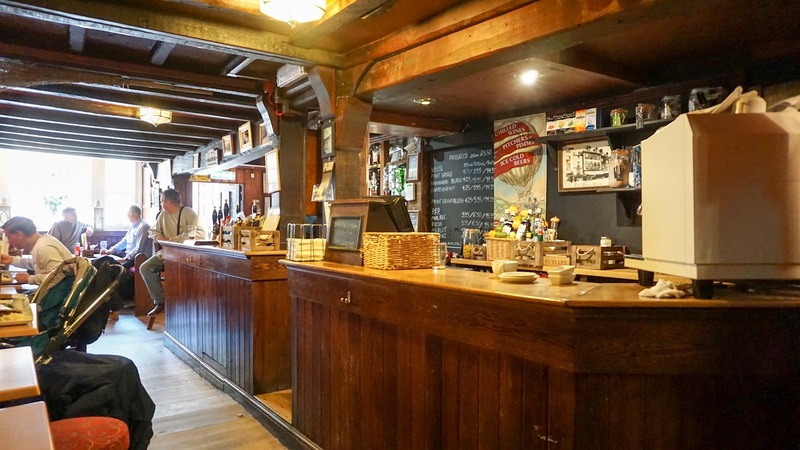 The boarding house never reopened but the pub has stood the test of time. 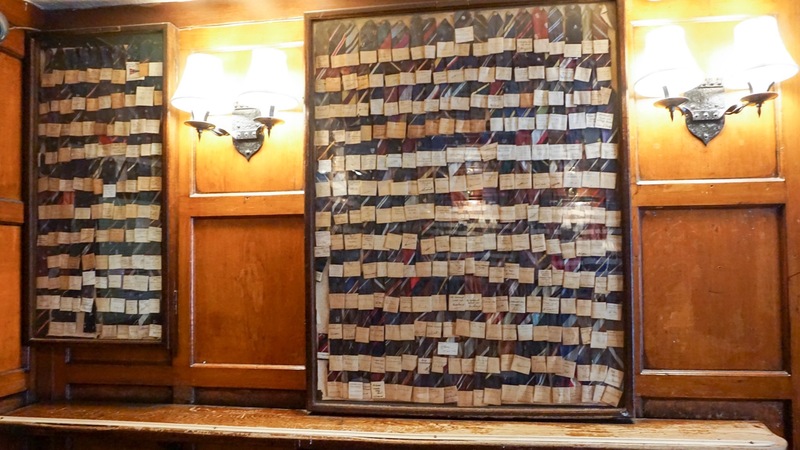 The walls of The Bear are covered in ties donated to the bar in exchange for a pint. They date from the 1950s to the 1990s, when a new owner took over and stopped giving out free beer in exchange for your tie. 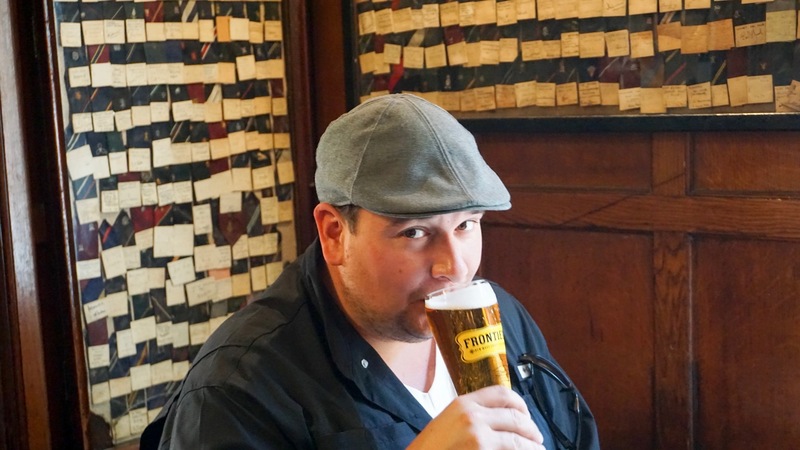 Supposedly, the former owner actually used a special false bottomed glass so the lads never got as much beer in the exchange as they had “hopped” (Ba dum tss!). But their ties (and signatures) are still ensconced on the walls of their favorite bar, so probably still worth it. We probably would have enjoyed another, but alas, our meter was again running out.